A new ownership group has been formed to bring Major League Soccer to St. Louis! They have chosen a site directly west of Busch Stadium for a new 20,000 seat soccer stadium to be the home of the first MLS expansion team, the St. Louis Steamrollers. 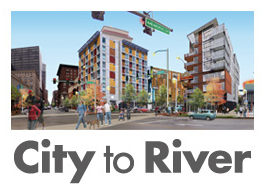 When asked for comment about the plan, a spokesman said they really liked they concept and planning process that went into the failed riverfront stadium for the now departed Rams, but preferred a more central Downtown location. 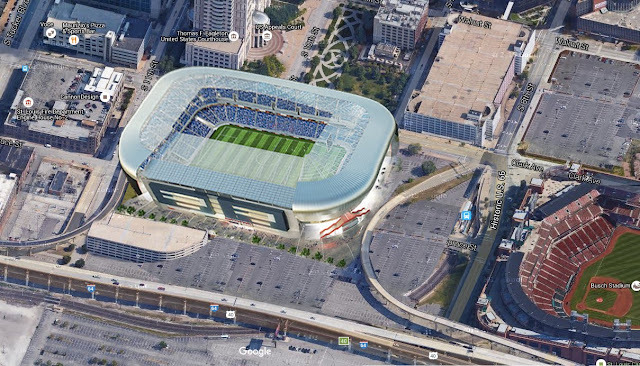 What sold them was the idea of having the existing parking infrastructure for Busch Stadium and Scottrade Center as bookends for the new soccer stadium. A real estate broker has secured options on all of the remaining buildings at Cupples Station, which will be demolished for the new stadium and additional surface parking lots. MODOT has agreed to re-locate two ramps to maintain the present access to highway 40/64. The ownership group hoes to have the stadium ready for the 2018 season.